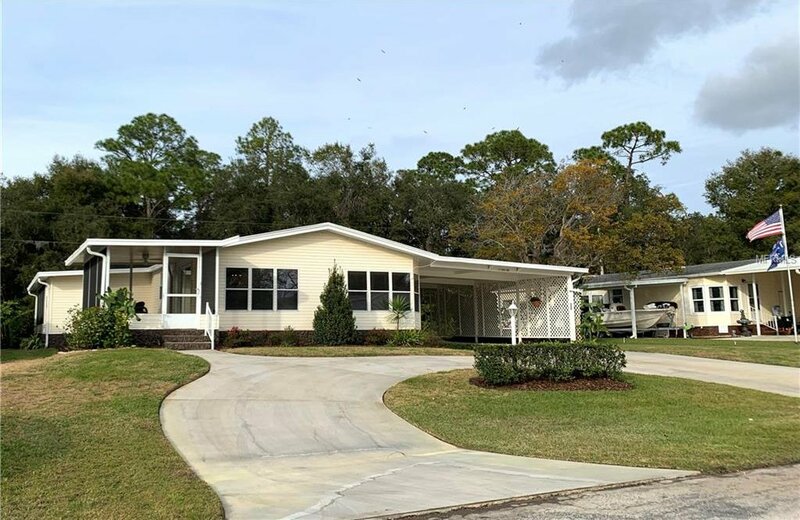 Located in the Traders Cove 55+ community, this updated, airy home is nestled near the St. Johns River. Situated on an oversized exterior lot with wooded views in the back yard. Including 2 roomy bedrooms and 2 baths, it also contains an additional 384 sf of living space in a bonus area with wide possibilities for usage. Upon initial entry, you walk into a warm, open-concept living and dining room area that incorporates updated fixtures and a glass-doored, built-in buffet with ample storage. The grand master bedroom has a walk-in closet with mirrored doors. The master bath has dual sinks and a separate shower and toilet area. The updated kitchen is the heart of the home and includes wood cabinets and beautiful, durable granite counter tops. The counter-height island is a great place to have your morning coffee, seating up to four. Family room has a built-in wet bar with cabinets and glass shelves which could be used for additional kitchen storage or a coffee bar. The kitchen, the eat-in dining nook and the family room are all open to each other in a space large enough to entertain. There are two screen-enclosed porches that view the neighborhood out front or the backyard. New A.C. 2018, updated fixtures, irrigation run on well. There is a deeded dock that is offered to the buyer at a sale price of $12,000. This community has it all- heated pool, clubhouse, fishing dock and a homey neighborhood feel. You'll be singing there's no place like home in no time! Listing courtesy of DEBARY REALTY. Selling Office: ATKINS REALTY GROUP.